10/2 UPDATE: Are Facebook Page Numbers REALLY Down? Something is wrong with the Reach of Facebook Page posts. I’ve wanted to write this post for a couple of weeks now. But I had a heck of a time until now finding the smoking gun. I didn’t want to claim there was a problem when it was really just me. Has anyone else noticed a drop in reach the past few days? It’s always possible that I’m not that interesting lately since I was writing on the road. But just want to be sure that it’s not due to some global change that Facebook made. Also wondering if it’s a statistical bug since I’ve seen more examples of reach not appearing at all at the bottom of posts. What are you seeing? I’m a hawk with my Facebook Insights, and I noticed this almost immediately. I had pinpointed the start of the problem as being on August 28. Many members within the Group reported the same thing. There have since been other posts from frustrated Page admins reporting no improvement. Something was quite clearly wrong. 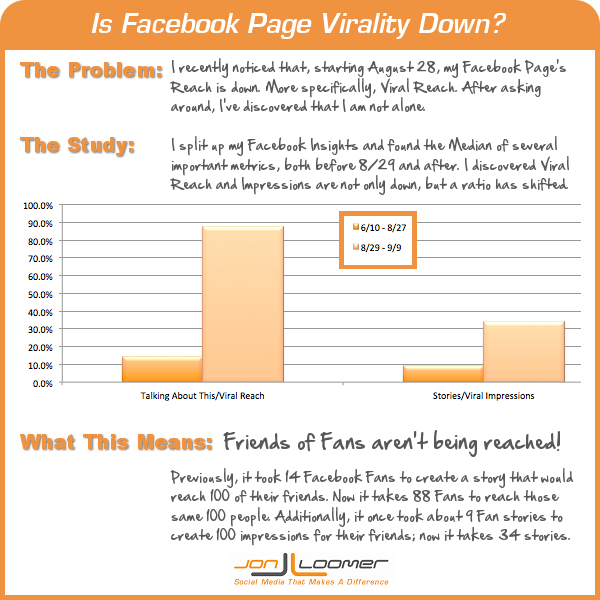 Have you noticed a dip in your fan page post reach lately? Something wonky happening with the EdgeRank algorithms, maybe? Hm. Mari Smith has nearly 80,000 Facebook Fans. If she sees it, I see it, multiple others are seeing it… It’s there, people. There’s a problem. I’ve dug into my data multiple times since this discovery, but it wasn’t until today that I finally found the data to make an open and shut argument. I found that some data was virtually unchanged, some data changed a little, but some data is off significantly compared to before August 28. First of all, you may want to brush up on what some of the data means. Read this post: Facebook Insights Glossary of Terms. I pulled the Post Level Facebook Insights for Jon Loomer Digital for the dates of June 10 through September 9. I wanted a three month period to provide as much data as possible. I made the final date September 9 instead of something more recent with the understanding that older posts have had more time to receive more Reach and Engagement. But after a week, posts are — for the most part — dead. 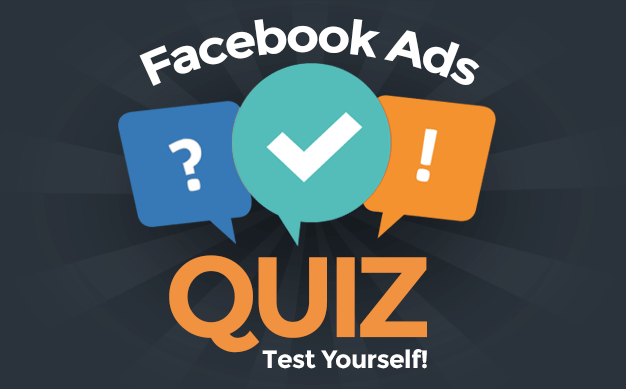 I also removed any data related to Facebook Questions and focused entirely on Links, Photos and Status Updates. I’ve stopped using Questions in September, and I used them every day in August. I felt that this could easily throw off my results otherwise. That left me with 205 Facebook posts (yes, I post a lot). I then found the median of all data from June 10 through August 27 and then from August 28 through September 9. I used medians to cut out posts that are well outside of the norm that would otherwise distort my results. It’s important to remember that the number of Likes to my Page is constantly increasing. I had 3,947 total Likes on June 10 and 5,457 by September 9. I considered using ratios, but I’ve found that you really can’t extrapolate Reach and Engagement on a Per Fan basis. But certainly keep this in mind. I created separate charts to break up the big and little data to show just how close it is. In most cases, numbers went up a little from August 28 through September 9. In a couple, it went down very slightly. Based on these metrics alone, there would appear to be no issue. These are many of the major metrics. I’m actually surprised I even noticed a problem. One issue, though, is I would expect that the more recent data would be up more than it is based on the growth from the beginning of this test period. But still. No red flags here. Even though the difference in Talking About This among Fans is only “1”, that’s significant given the difference in Likes between the two sets of data. Okay, so now I’m concerned. I actually am reaching fewer Fans than I was before. Not a significant number, but enough to be a problem. My average post was previously seen by 59 friends of Fans through a story generated by Fans; that number is now down to 8.5. Similarly, the number of such impressions is down from 87 to 22. That’s an incredible drop. Viral Reach is now 14% of what it once was while Viral Impressions are about 25%. But how can this be? Almost all of the other data has remained nearly the same. Around the same number of Fans are creating stories and “Talking About” my content. But it would appear that far fewer of their friends are seeing this. So let’s break this down a bit more… What is the correlation between the number of people creating stories (People Talking About This) and Viral Reach (the number of friends who see those stories)? How about between stories created and Viral Impressions? Previously, each 14 people who created a story about my content would result in reaching 100 of their friends. That makes sense, right? But now, it takes nearly 88 stories to reach 100 of their friends. Previously, nine stories generated by Fans resulted in 100 impressions for their friends; now it took 34 stories to generate those 100 impressions. This doesn’t make much sense. The number of people your post reaches through Fan activity is now close to a 1:1 ratio. So while your Fan may have 500 friends, only one of them is seeing when they Like, Comment or Share your content. How can that be?? Let’s assume that the first one is the issue. All along, we’ve been freaking out about Fans seeing our content. You know, EdgeRank is limiting it to only 16% and all. But it would appear that the new problem isn’t reaching our Fans (though that may be down slightly), but our Fans being able to reach their friends with our content. Does that mean that EdgeRank is preventing this? Possibly. Or it could be that more data is flowing through Tickers, so they’re seeing less. Or it could mean that they are online less often. It could mean a few things, but it doesn’t necessarily mean Facebook is preventing it. And it’s possible that the data is simply wrong. If that’s the case, all of this data would have to be wrong, not just the Viral data. It just doesn’t fit together otherwise. I’m still trying to piece it all together, but it will help to get as much data as I possibly can. I’m just one person with an audience of about 5,000 people. It doesn’t mean anything by itself. The sample size is simply too small. But I know others are seeing it, too. How about you? Are your Viral Reach and Viral Impressions noticeably down? Let me know in the comments below!